Pyle PLMRWB45W wakeboard speakers are constructed with marine applications in mind - they're water resistant and would work great on the dock or at sea. 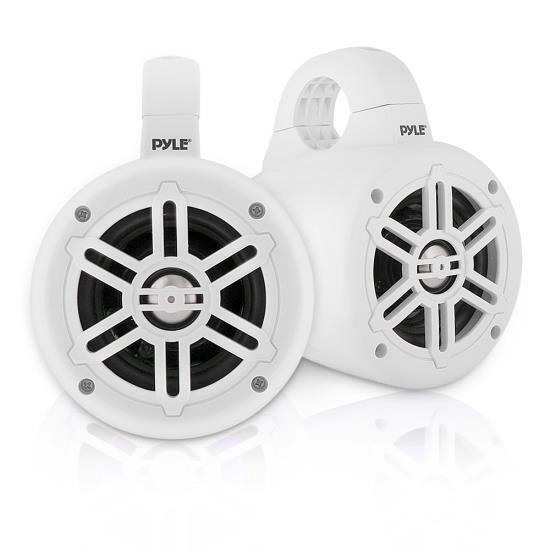 These 300-watt speakers are equipped with a 4-inch woofer for a booming low end and 1' titanium dome tweeter for sweet highs for a frequency response of 70 Hz to 20 kHz. Heavy duty construction extends the life of your product, and weather resistant housing keep your sound distortion-free. Mounting bracket included.